We've recently started taco evenings with the children and they've been a roaring success. I suppose it's the spread of food in front of them and the feeling of building your own meal that appeals to them. We're sharing everything together and I think it means they feel quite grown up and part of the fun. Usually, I'll just make a chicken dish seasoned with cumin, oregano, chilli and other bits and pieces (we call it taco seasoning, it could be called adobo spices), but this time I got the heavy guns out and went a bit nuts. There was plenty left over which went in freezer bags for next time, so it wasn't as crazy as it looked when I lay it all down. I'd suggest picking one or two dishes depending on how many people you're feeding and depending on how long you want to spend in the kitchen. I was in a food frenzy, you may not want to be. Whatever you do, you must serve the tacos with guacamole, sour cream, chopped tomatoes and grated cheddar. The dishes we had are as follows (deep breath): Homemade corn tortillas, guacamole, pico de gallo, adobo sauce, chicken with taco seasoning, red onion pickle, sour cream, slow cooked shredded pork cheek with barbecue sauce, fried prawns with Old Bay seasoning, lime and coriander mayonnaise, shredded gem lettuce,spring onions, coriander leaves and lime wedges. All this for an early evening supper with the kids. Totally bonkers and never again on such a scale, unless someone pays me. The children loved making the tortillas though, and if you don't have a tortilla press (they're cheap and available on mexgrocer.co.uk along with almost everything you may need for mexican receipes) you may want to save yourself the bother and buy corn tortillas ready-made. Of course, they're not as good and often have wheat flour in but if it saves your nerves from becoming as shredded as the pork, then it's probably a good thing. The pickled red onion recipe is here, but for the rest (apart from guacamole, I'm not going to bother giving a recipe for that) hold your breath and keep reading. Corn Tortillas: One part masa harina (corn flour) to one part warm water and a pinch of salt. Simply mix the ingredients together until they form a dough much like 'playdoh', leave to rest and then form into small balls and press between sheets of plastic (I used a cut up ziplock sandwich bag) on the tortilla maker. Cook on a volcanic cast-iron griddle pan until both sides are tortilla-like then throw on a plate and continue until you have a pile of them. Cover and leave until you're ready to eat. Pico de Gallo: This is essentially a fiery tomato salsa, but here, I've left the cherry tomatoes quite large so it's a little like a salad. Just mix together a load of chopped cherry tomatoes, some finely sliced onions, a chopped serrano chilli, some fresh coriander, salt and a good squeeze of lime juice. Leave to rest for about twenty minutes before serving. Adobo Sauce: I soaked a large dried ancho and chipotle chilli in hot water for about half an hour then blended it with a thumb of ginger a tablespoon of ground cumin and a pinch of salt. That's it. It's pretty intense and sharp, but goes really well with the other dishes. Chicken with Taco Seasoning: Take one chicken breast and slice it thinly across. Toss it in a bowl with as much as you feel of paprika, pepper, onion powder, oregano, cumin, garlic powder, salt, chilli powder and ground coriander. Why don't you start with equal amounts of each, see what you like and adjust it from there. Then, as I have done, you can make a big jar of it and you've got tacos a-go-go hey presto! Sauté the chicken in a hot frying pan with some olive oil until cooked. Add a splash of water at the end to deglaze the pan and pour everything into a bowl. Shredded Pork in Barbecue Sauce: This is a slow-cooker winner. I now buy all my meat from the incredible Anne Petch at Heal Farm in Devon. It's close to the supermarket prices and miles above in quality and welfare. She sends it by courier the next day and I cannot recommend her highly enough. I discovered her in Jane Grigson's 'English Food' and was delighted to find she's online and thriving. I felt I knew the pigs I was eating, and being in London feel much more connected to the food as is possible in a city. Take one onion, two cloves of garlic and 500g of pork cheek (diced) and brown them in a pan with some olive oil. Season well and add to the slow cooker. Add one sliced green chilli and some dried thyme sprigs and turn the slow cooker onto high. If you don't have one, you could cook this in a casserole in a low oven for the same amount of time. Make the barbecue sauce by stirring together: 1tsp tomato purée, a pinch of coconut sugar (or brown if you don't have any), a good squeeze of lime juice, probably about a lime's worth, a large pinch (depending on the size of your fingers) of garlic powder, some chilli powder, Cayenne pepper, thyme leaves, dried oregano, ground cumin, finely diced onion, chipotle paste, a good splash of Worcestershire sauce, a spoonful of Dijon mustard and some tabasco sauce. As for exact amounts, just trust your nose and instincts. I make mine with varying pinch sizes every time and it's always delicious. Add the barbecue sauce to the pork cheeks, stir well and cook with the lid on on high for four hours. Cool a little and shred with a pork. Pour into a bowl to serve. This one's a winner the next day in a sandwich too. Fried Prawns with Old Bay Seasoning: Or shrimp, as the Americans would have it, is a version of the famous fish taco. You can buy Old Bay here and I'd recommend a box for the packaging alone. I made a quick batter with flour, sparkling water and a good few spoons of Old Bay then deep-fried them until crisp. Easy as that. Lime and Coriander Mayonnaise: Make some mayonnaise and stir in some lime juice, lime zest, pepper and chopped coriander. What else do you want to know? And that's pretty much all you need for a taco party. Just make sure you're wearing elasticated trousers and have no plans for the evening. Even if you're having these at lunchtime. The eye-watering sharpness of a pickled onion from the fish and chip shop feels like they've been steeped in jet fuel or paint stripper. It appeals to me in the same way sour sweets or extra-hot chillies do, almost a test of endurance. But there is pleasure to be had in bitterness. The sharpness of pickles cuts through the richest meat and it's no wonder jalapenos in vinegar are a staple with nachos, or chutneys and sharp fruits go so well with roasts or cold leftovers. I often get these ideas in my head that it would be greatly frugal and Mrs Beeton-like if I made a ton of apple chutney or a vat of pickled courgettes and so on. But in truth, these jars sit at the back of the cupboard slowly softening and melting until I need the jar for something else. Knowing myself better, I find it much better to make small quantities of quick pickles for immediate use and occasional using up over the coming fortnight. Radish and mushroom for example to go with a quick poached salmon fillet for a light supper. Just a small bowlful, covered with vinegar and sugar and rested for about twenty minutes is perfect. Here, I've made half a jar of red onion slices in white wine vinegar. Perfect for our weekly tacos with the children as a final topping and also finding its way into the occasional sandwich. It's still important to sterilise the jar. But this is as easy as giving it a quick wash with hot soapy water and blasting it in the microwave for two minutes. Don't forget to remove the metal parts beforehand though. Method Put the onions in a sieve and pour over a kettle-full of boiling water to soften and blanch them. Dissolve the sugar and salt in the vinegar and add the remaining ingredients. Put the onions in a glass jar and pour over the vinegar mixture. Leave for at least half an hour before eating but it tastes even better the next day. This keeps well for about five days. And goes brilliantly with fish and seafood as well as tacos. The evening light fades so quickly in September. It feels like only last week that the sun was setting late after nine o'clock and our nights were short with dawn flooding the bedroom around four. Now, it seems barely seven and candles are being lit and quilts thrown on the sofa. But for me, this is a time of great happiness. It's hygge time. Time to get roasting, stuffing and braising. There still will be salad on our table most nights though, no one comes between me and lettuce. Not even nature. I found these beautiful gem squash, fitting their name perfectly, at Crystal Palace Food Market on the weekend, among other great fruits of the season. A giant spaghetti squash, heavy as a medicine ball, striped yellow and green courgettes, firm and skinny, ready for dicing and sautéing quickly with some garlic and olive oil. There were thick, short cucumbers, perfect for a salad, tasty and thick skinned unlike the watery green sticks of the supermarket. The colours of the season are reflected in the stalls. The oranges, browns and deep greens mirror the leaves on and off the trees. Black kale, red chard stalks and the inky purple of beetroot look like a Spanish still life and those evenings, warm inside against the soon to be here misty, haunted nights seem to be a comforting pleasure against the dark. I stuffed the squash with cubes of lamb chop. Cook the lamb first to render the fat and give some colour to the meat. Then let it cool a little and shred it from the bone. And if you don't have mushroom ketchup, use Worcestershire sauce. Be sure to have a gentle hand with the seasoning, those bottles pack a punch, and if you want chilli heat rather than warmth, add another chilli, or a sprinkle of chilli flakes. Method Heat the oven to high and prepare the filling. Sear the chops all over and add the onion, garlic and chilli to the pan. Turn the heat down and continue cooking until the onion is soft and translucent. Add the barley and rosemary and a fairly large splash of water. Let that reduce away for a few minutes then add the mushroom ketchup. Remove the lamb, let it cool a little so you can then take the meat from the bones and finely chop it. Mix back into the pan and stuff each squash to the top. Sprinkle over the nuts and put the lids back on. Roast in the oven for 35-40 minutes, until the squash are soft. Serve straight from the dish. I prefer Autumn lamb, more flavoursome than spring and in my mind, less mean-spirited to eat. It's had a chance to gambol about and is saved from the misery of the long dark days of winter. It will never know what it's like to leave the shed first thing in the morning in the dark and come home after a hard day still in the dark. It's had one glorious summer. Harissa, garlic and rosemary were born to go with lamb. Spread all over a leg and studded through is a heavenly mix. Here though, I've stuffed the breast with a few other bits and pieces then rolled it tightly, slowly roasting it, at first on high to crisp the skin, then slowly for a few more hours so all the flavours melt into each other. Once you've done the chopping, which is a pretty quick job, you can just put it in the oven and you're free to do some gambolling of your own. Method Heat the oven to 220c Roll back the layers of meat and sprinkle the thyme and cumin seeds under the first layer of skin. Lay the next layer back down and spread all over with the harissa then sprinkle over the pistachio. Spread over the onion, garlic and chilli then the apricot and capers. Crumble over the feta and sprinkle on the cinnamon. Tightly roll the lamb and tie it well all round with string. Cook for half an hour then turn the oven down to 150c and cook for another two and a half hours. Leave to rest and carve into slices. And the nights are drawing in. Summer's almost gone, before we know it we shall be wearing makeup and knocking on neighbours doors demanding sweets. Even if you don't have children, this is great fun. I'd even suggest doing it mid-July if you fancy a laugh. But before then, it's my favourite time of year. The leaves turn gold and orange, the crisp, blue mornings with their low sun skies turn the walk to school into a show of colour and misty breath, wrapped up against the coming winter. It's the time to eat comforting food that's not quite long slow-braised beef shin stews, thick, rich and brown, but bridges the seasons. Cooking the pasta in the pan with everything else gives it real depth and reminds me of some of the meal in a bowl soups my mum used to make for us. There's so much going on, but really takes very little effort to make. Fresh bay leaves from the tree make the difference here, but use dried if you must. And don't bother doing your own peppers, just buy a good jar of them. There are some things that just aren't worth the fuss. Method Heat some oil in a large, lidded, heavy and shallow pan. Fry the chicken, seasoned, skin-side down until golden then turn and cook for a couple of minutes. Add the garlic and onions and cook for a minute longer. Throw in the peppers, olives, bay, bouillon, and orzo then just cover with boiling water. Sprinkle over the oregano and cover with the lid. Cook gently for about ten minutes, until the orzo is soft, but with a little bite. Serve from the pan at the table. We don't often eat pork chops in my house. We've had the fear put into us by my mother-in-law that we will have a terrible night's sleep if we eat pork in the evening. Also, I've possibly been put off it by years of having to endure eating grey, leathery shoe-sole tasteless meat disguising itself as food. You'd think it was still wartime the way some people still cook it. Make sure you but good quality pork, from well looked after pigs. That's a good place to start. And don't be scared of it being a little pink in the middle. That way, it will be juicy, tender and flavoursome and will, with hope, overcome bad memories of the school lunch hall, chewing interminably and trying to move 'food' around the plate to make it look as though you've polished most of it off and are bloody well grateful, boy. I didn't fight in the trenches surviving on tinned pilchards for you to etc etc. Today's recipe is simple and very quick to make. Pork, creamy mushrooms and mustard is a classic combination and while it may seem to be a little old-fashioned, there's nothing wrong with that; delicious is delicious. The sesame broccoli brings it out of the aspidistra lined 1970's suburbs a little, just don't boil the veg. for four hours. Method While heating a cast iron skillet for the meat, gently soften the onion in a sauté pan in the olive oil until translucent then add the herbs and mushrooms. Season well and cook until the mushrooms are colouring. Add the cream and stir in the mustard. Cook for a few minutes until the cream thickens. Loosen with a little water if it gets too thick. Taste and adjust the seasoning and mustard. Cook the pork chops on a high heat for a few minutes on each side until golden and the fat is rendering and crisping. Hold it down on its fatty edge to achieve this. Leave it to rest and boil the broccoli for about four minutes. I slice the stems and throw them in a minute before the florets. Drain very well, water really gets stuck in all those buds and drizzle over the sesame seeds and oil. Serve the pork with the sauce and broccoli. Yesterday was a low-calorie day for me as I endeavour to return to the svelte, Adonis-like figure I had when young. Perhaps aiming for the slim figure I had when at art college where I survived on roll-ups and the occasional halloumi kebab is misguided. One thing that doesn't help on those days is when you have to spend the afternoon with apple crumbles surrounding you like the Devil on your shoulder. Taunting you, mocking your metabolism and lack of exercise. I held fairly firm, I mean you have to check your recipe tastes good before you let other people eat it don't you? But I decided I would make another one today and have a bloody great big bowl of it. This is one of the classic British puddings. Really simple, and with only a few steps, almost fool-proof. That doesn't mean there won't be complaints though. It's one of those dishes that is so full of childhood nostalgia that you can come a cropper if you leave the apple chunks too large, put blackberries in it, dust it with maple sugar, add orange zest or who knows what else. If it's not like the one your mother or grandmother used to make, it's not good enough. (That is assuming they could cook. They may have been complete disasters in the kitchen). Risking the wrath of my wife, I added thyme and blackcurrants to this one, as well as yeast to boost the appleyness of the Bramleys. Her portion disappeared in a flash. Method Heat the oven to 180c Coat the apple in the lemon juice, tossing well. Cook the chunks in the sugar, butter and yeast water until softened. Mash half of the apples, leaving the rest nice and chunky. Stir in the thyme and blackcurrants then transfer to a large baking dish. Grate the butter into the sugar and flour to make the topping. Rub it all together between your fingertips until it's sandy. A few lumps left here and there will give nice texture when it's cooked. Spread the crumble over the cooked apple and cook in the oven for about 45 minutes. The top should be golden and crumbly. Leave to cool a little and serve with ice cream. Or cream if you like that kind of thing. Which I don't, so it's wrong. The carrots are past their best. No longer firm and snappable, they bend like a theatrical prop. No wonder really, they have been sat outside in the sun on the table for a day and a half. I'd forgotten about them among the tumbling bags of vegetables I'd brought back. Still, that doesn't mean there isn't a use for them. A few made it into my morning smoothie and the rest, determined to make something with them, I turned into cake. Surely bendy and tired fruit becoming cake is like turning base metal into gold. And not only that, I used coconut sugar in the mix rather than cane. So it's almost doubly less healthy. If you don't count the icing sugar mountain that went into the cream cheese icing. As a cake is a treat, let's not beet (sugar) ourselves up about things being unhealthy. It's not as if I had a slice of it for breakfast the other day... But this cake is delicious, moist and with the fragrant scent of orange blossom and clementine zest, is a wonderful moment of calm with a coffee or tea mid-afternoon when spirits are flagging. If you don't hoover the lot up in one sitting (assuming you're sharing) it keeps soft and moist for what seems an eternity as long as you keep it covered. I can't see that happening though. Method Cream together the butter and sugar. Beat in one egg at a time until well mixed then stir in the flour and baking powder little by little until you've used it all. Try not to over mix it. Stir in the orange blossom water and carrots and mix well, but gently. Divide between two 19cm prepared cake tins and bake immediately at 180c for approximately 40 minutes. Leave the cake to cool completely or it'll be sliding all over the place like a plastic fire guard. Beat together the butter, cheese, icing sugar and vanilla until soft and smooth. sandwich the cakes together with a good load of the icing then coat the top and sprinkle over the zest and nuts. Chill for about half an hour if it's a hot day to give the icing a fighting chance then serve. First of all, if you don't like beetroot, please leave the room because a: I don't trust you b: you won't like this curry. It tastes of beetroot. For those of you still here, this is a rather special curry. One of those where the taste lingers long after in the mind. In fact, I was dreaming of this dish the day after I made it, keen to cook it again at the soonest opportunity. It's rich, soothing, earthy, firey (and possibly windy), and the dense texture of the beetroot is quite unusual in that the in the curries I usually have, the main ingredient is soft, tender long cooked meat that falls apart, delicate prawns, or meaty fish. This has bite. And the sauce... dredging the chapatis through the deep burgundy velvet is an indecent event. I'd stress the importance of fresh curry leaves. Don't bother with dried ones really. At the very least, use fresh curry leaves you have frozen (which they are very good for). I normally buy quite a few bags and keep them in the freezer just in case. They are so distinct and have such a recognisable aroma when they hit the hot coconut oil in the pan that they immediately hit my memory button of being in Sri Lanka. Method Heat the coconut oil in a large wide pan and add the mustard seeds. When they start to pop add the cinnamon stick and onion. Stir well, season a little and cook gently until the onions start to soften and turn golden. Add the turmeric, coriander, garlic and ginger then stir in the curry leaves. Add the chillies and beetroot, stir well and cook for a few minutes. Pour in the coconut milk and mix well. Bring to the boil then turn to a low simmer and cook for about 45 minutes, turning the beetroot occasionally so they cook evenly and the sauce reduces and thickens. If the sauce gets too thick, add a splash of hot water and stir well. Taste, adjust the seasoning and leave to rest while you make the chapatis. Mix the flour, salt, garam masala and water together in a bowl until it forms a dough. Knead for a few minutes then divide into eight balls. Heat a cast iron skillet until red hot and thinly roll out a dough ball into a circle. Cook it in the dry pan until it starts to bubble up. Flip it over and cook until the other side bubbles. If you have a gas hob, finish each bread directly on the flame for about 20 seconds, they puff up really well and char a little. Repeat until you have used all the dough. Heat the curry through, sprinkle over the pistachios, coconut and coriander and serve with the chapatis and some basmati rice if you like. I've been a little less than enthusiastic about cooking the past week. It happens every now and then. Coming up every day with something exciting to eat for supper can be a train that runs out of steam occasionally. Getting back late from shoots and peering into an uninspiring fridge means we've also eaten out and had takeaway more than usual recently. Mostly, I'm up to the challenge and will happily cook a quick prawn curry, a risotto or simple pasta with salad. Last week even that was beyond me. It happens. Perhaps it's the laziness of summer, the thought of holidays and eating lunches by the water's edge, white linen tablecloths and the clinking of ice in glasses. But last night, I roused myself from my torpor and cooked a simple steak with asparagus and baby potatoes with chive butter. There was a delicious tomato salad with balsamic on the side and a bowl of green leaves, lightly dressed with vinaigrette to cut through. It was lovely. Today, with a little more time I'm making a carrot salad for lunch. I've jazzed it up with some fun ingredients. It's worth every now and then going out of your way to buy strange things such as cucamelons or shiso leaves, it adds a little wow factor. Just buy or grow what you can and have fun, remembering to use good things simply. They often speak for themselves. This salads simplicity, colourfulness and delicacy is just as exciting to look at as it is fresh, delicious and healthy to eat. If you don't like anchovy, leave them out of the mayonnaise, but they are a taste worth acquiring. Method Make the cumin oil first. Heat a small pan with the olive oil and add the cumin seeds. Heat until the cumin becomes aromatic, then turn off the heat and leave to cool. Sometimes I get whims. A baguette here, a tray of soft buns there. This morning I was taken by the desire to bake some fougasse. I used my usual dough mix for this. It's always amazing to see the difference a shape can make to the taste and texture of a recipe. This bread is soft in the middle and crisp on the outside with a good bite. You can add herbs and a handful of chopped olives to the mix if you fancy. Perfect with a plate of charcuterie and cheese. Bon appetit. Mix the yeast and flour together and slowly add the water, stirring well. Add the salt and knead for about ten minutes in a machine if you have one. By hand if you prefer. It depends on my mood which one I do. Leave to rise for an hour then divide the dough in to two balls and roll out into a leaf shape. Transfer to a baking sheet and cut a line down the middle and three cross lines either side to make the leaf vein shapes. Cover and leave for another 15 minutes. Heat the oven to 200c and add a shallow tray of water to the bottom to create some steam which will give you a good crust. Bake the dough for about 20 minutes, remove from the oven and leave to cool before serving. Yes, this is my second mushroom recipe this week, but I had to use them up somehow. And yes, it has noodles in it, but this couldn't be more different to the fettuccine with mushrooms dish if it tried. Although that's not strictly true, it could be soup. Or a croissant. This is a comforting as well as zingy meal. Sometimes we want that carby hit and a bowl of noodles is just the thing. This one seems almost healthy with all the basil. Method: Mix the soy, fish sauce and turmeric in a bowl. Heat some oil in a wok and gently fry the galangal, garlic and onion. Turn the heat up and add the mushrooms. Season with a little salt and add some chilli oil. Fry until golden in parts and softened. Turn the heat back down. Add the egg to the pan and scramble gently. Pour in the soy mix, chillies and noodles stir and add the water. Turn up the heat and heat through. Mix through loads of the Thai basil, add a drizzle of chilli oil and more chillies if you like it hot, which I do. Just as I was packing away my shorts, chucking out the sun cream and darkly muttering about the "nights drawing in", the bloody sun finally comes out. I was conceding defeat and willing to go straight from Spring to Autumn (which is my favourite season, so there are positives). Now, everywhere I go people have stopped complaining about how rubbish our summer is to complaining about how it's too hot. This is further confused by my job. We generally are at least a month or two ahead when it comes to shooting ingredients or writing recipes. We shoot Christmas in July, Easter at Christmas, Autumn in Summer and I'm always having to find impossible ingredients. It's nearly mushroom season though, and after a shoot this week for September, I have a great box of them. So here is one of my favourite recipes for pasta. Silky and earthy with a pinch of heat. A good pasta dish can be hard to beat. I had a fantastic spaghetti alle vongole with bottarga at Mediterranea on the weekend with my parents. I could have been sitting in the square in Forte di Marmi eating it with the sun guaranteed, gushing on about how you can't get food like this back home. But here we are, so instead, I'll pretend it's Autumn and get the umbrella out. At least I can also use it as a parasol if the sun sticks around. Method: This is such a simple dish, but make sure you go heavy on the flavours. Cook the mushrooms just right and this will be a real winner. You could finish it with a little truffle oil if you like, just to give it that little extra. Bring a large pan of heavily salted water to the boil for the pasta. Heat a sauté pan with olive oil on a medium heat and add the garlic and mushrooms. Season well and add the mushroom powder if you have any. Stir well and cook until the mushrooms have softened and are golden. Don't let them dry out, but also don't take them out too soon so they're too liquid. Cook the pasta until al dente, drain and pour through a good glug of olive oil. Stir the chilli flakes and parsley into the mushrooms, check and adjust the seasoning and stir through the pasta. Serve immediately with a drizzle more of olive oil and a good helping of grated Parmesan. When I was at art college back in the last century and life was in black and white, we'd often indulge in haloumi kebabs after a night out. That was the first time I'd had this squeaky cheese, and fresh from the charcoal grill with hot chilli sauce I was hooked. These days, having children means I don't really remember what going out is. And with life far more civilised, I make my own kebabs and roast my haloumi. How grown up I must seem. Being a solid cheese, it holds its shape really well when cooked. And it takes up other flavours so well, making it ideal to wrap up with garlic, rosemary, lemons and the like. Here, I've used limes, caper and anchovy to give it a real punch and some sweet fresh snow peas and radish to cut through. After about half an hour, you'll have a delicious lunch with almost no effort. Great with some toast and a cold glass of something fizzy. Method: Heat the oven to 180c. Wrap the cheese in paper with the limes and garlic underneath and everything else on top. Fold over and wrap in foil. Cook for about 25-30 minutes, remove from the oven and serve with bread, olive oil and crudites. I had a couple of packets of baby turnips in the fridge. I always struggle with them, as in, what is their point? I've always thought of them as a bulbous, soft crunch of flavourlesness. A little like eating a toasted tennis ball. To give them a chance, I threw some of my favourite flavours at them, knowing that whatever I did would be an improvement. It's hard to improve upon slowly caramelised onions, and the thought of draping them over the turnips once they had been roasted in some chilli oil was enough to get the oven on first thing this morning. Three quarters of an hour later and I had a delicious mid-morning snack with enough chilli punch in it to finally get the day going after having survived my children's joint birthday party with no fatalities and I think all children safely returned. We may yet find one or two in the bushes. So turnips are safe, for now. This would make a splendid accompaniment to spatchcocked, grilled tandoori-spiced chicken or roast coriander and cumin slow-roast lamb shoulder. Now there's an idea for next weekend. Method: Heat the oven to 180c and roast the turnips, drizzled with the chilli oil for about 45 minutes. While they are cooking, finely slice the onion and slowly sauté in the ghee with the spices and a little seasoning. Cook slowly until they are golden and starting to ever so slightly caramelise. Spoon over the turnips, drizzle with a little more chilli oil and scatter with chilli flakes. Serve immediately, being careful to not burn your tongue on the onions like I did. 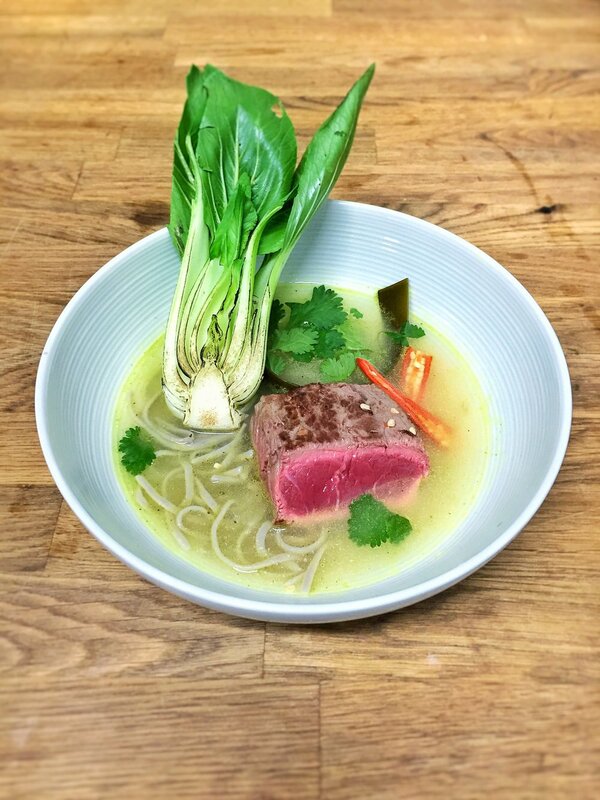 Before you start, this isn't ramen in the proper ramen way, more of a broth with some things in, one of those things being a beautiful piece of seared sirloin. But as with real ramen, the key is the depth of the stock, so try and use a homemade one full of flavour, and when heating it up for the final dish, add in kombu, plenty of fish sauce, lime and lemon juice. It's quick (well, once you've made the stock), nutritious and rammed with flavour. Bring the stock to the boil and keep hot. Sauté the garlic and sear the steak, then remove from the pan. Sear the book Choi quickly then add the kombu, lemon, lime and fish sauce to the broth with the chillies, ginger, noodles and garlic. Cook for a minute then put the cooked noodles, bok choi and steak in a bowl and pour over the broth and serve with coriander. Actually, this has nothing whatsoever to do with Calais, I've just always wanted to make that joke. And seeing as we're being robbed of a decent summer here in London, you've got to get the laughs where you can. Nothing quite beats a good burger, unless you're vegetarian of course. And nothing quite beats a homemade one either. You can add all kinds of spices and herbs to it to pep it up a little, or, you can keep it simple, but know exactly what's in it. I usually add some red onion compôte to my burger mix, but today I've just gone with finely chopped red onion. Added to that are some capers for a little zing, a few dried herbs (I find adding fresh ones too mimsy) and for smokiness, some paprika. Ready to cook after a little rest in the fridge to firm up and you can do this on the barbecue if you're somewhere sunny, or just on a hot griddle pan if you're in England. Ingredients (per burger) 150g good minced beef 1tsp dried rosemary 1tsp dried thyme 1tsp smoked paprika 1tsp capers 1 tbsp chopped red onion Some beaten egg (1 between 2 burgers) 1tbsp breadcrumbs Plenty of salt and pepper to season Some sliced red onion Some lettuce, tomatoes, pickles, mustard and ketchup and a good bun. Method: Mix all the burger ingredients together well and leave to rest for about 20 minutes in the fridge. Heat a griddle pan until smoking the. Cook the burger for about three minutes each side, longer if you prefer it well done. Cook the onion rings and toast the bun a little. I prefer sesame topped soft buns, a classic, but you may be trendy and want to use brioche... Your choice. Top a bun with lettuce, tomato and onion then add the burger, ketchup and mustard and eat with plenty of napkins. My freezer is sometimes an Aladdin's cave, sometimes a forgotten morgue. I've found pigs trotters, prawn and lobster shells, strange soups and chicken bones bagged and labeled under Thai broths, strange soup experiments and well intentioned litre upon litre of stock. While it's great for fish fingers and other things for the children, I really need to be better at keeping it organised. I need a chest freezer in the shed for the bodies more experimental stuff that I will use, just not on a daily, home basis. Method: Make the mayonnaise, stirring in the extra ingredients and tasting to check the seasoning. Put the crab claws in a bowl and toss around in the spices, spinach and nuts. Season well. Serve the crab with the mayonnaise and some ice cold ginger beer. It's been such a long time since I've eaten gooseberries. Perhaps since childhood, picked from the bushes in friends' gardens. Maybe once in jam at Badger's Tea House in Alfriston. A really toothsome Victoria sponge with elderflower buttercream. We rely on supermarkets so much these days that it's easy to miss short seasons, food we all knew. If you're lucky enough to have a good farm shop (I have Franklin's near me), market or grocers nearby you should be able to get gooseberries. And for that matter lots of other stuff the big shops can't be bothered with. This recipe is a semi-classic, (in fact, 'groseille à maquereau' is French for gooseberry) but I've added a hint of spice to it to give it a little zing. You don't need a million ingredients to make a great meal, and as well as being incredibly quick to make, I'd be more than happy if I was served this in a restaurant. Use the freshest mackerel you can get, and if gooseberries aren't available, try rhubarb or grapefruit instead. Method: Add the coconut oil to a saucepan and put in the chillies and grate in the galangal. You could use ginger root if you don't have any, but the flavour will be stronger. Add a pinch of salt and the spices, then the gooseberries and honey. Stir well and cook on a medium heat until the berries begin to soften and collapse a little. Stir in the cream and remove from the heat. Heat a cast iron sauté pan, score the fish skin and season well. Put the fillets in skin side up. While they are cooking, use a blowtorch to cook the top of the fish, charring it well so it turns black and gold. If you don't have a blowtorch, finish the fish under a hot grill. Let the fish rest for a minute, then serve with the sauce, a few raw, sliced gooseberries, the cress and lemon oil. A crisp green salad with hazelnut oil dressing and some charred baguette slices finish this off perfectly. A warm July Monday morning and I have just deposited the children at school for the day. Peace and an unheard silence start the week and I feel almost a little lost. It's been a busy weekend with the 6th NCT birthday party at a farm in apocalyptic flood rains, a night out at the Southbank including the worst burrito ever from a street food van, making us wonder if they picked the ingredients off the street (and this van was parked outside the restaurant, so God knows what the food was like inside) and then a school friend's sixth birthday party, fortunately nearby and lovely. I honestly don't know how children's entertainers do what they do without needing to sit in a dark room for a day after. He was, actually, more fun than the adult show we saw on Saturday. C'est la vie. So when you start the week feeling broken, cooking can be either therapy or chore. I know it's Monday, and the advice is always that fish is not to be trusted, like a shadowy figure appearing from a dark soho alley after a lost weekend, but I do have some nice sea bass that has been well looked after. Monday, for me is normally a low calorie day, I usually have a light supper as the only food I eat. I'm trying to keep my body from turning into a temple of doom. So here we are with something so simple it almost hurts. But the beauty of this is it's so simple it's amazing. Four main ingredients that take minutes to put together, but the result is light, delicious and healthy and tastes like a rather special treat. Sea bass, mushroom, artichoke (my favourite brand is El Navarrico) and pine nuts. The artichoke, slightly acidic acts like lemon would do with the fish. You can have this on the table in about five minutes. And on a sunny day, you can imagine yourself sitting by the harbour as the fishing boats come in on the clear azure waters of the Mediterranean. Unless you actually are there, in which case, just look around you and imagine yourself in the busy city and smile. Method: Heat a griddle pan until you can melt rocks on it. Rub some olive oil on the fish skin and season well. Place the fish skin side down on the pan and cook for about 2-3 minutes, until charred with the lines of the griddle and the fish lifts away without tearing. Turn the fish over and add the mushrooms, some more oil, the garlic and pine nuts. Cook for a minute then transfer to a plate. Add the artichoke, mix in a few herbs and serve with black pepper.